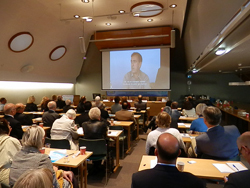 The European Leadership Conference in Oslo 'Sustainable Peace for a Sustainable Future' participated in the launch of the documentary, 'Within the Eye of the Storm' in the Norwegian Parliament, the Stortinget, to coincide with International Peace Day. It was also being shown in many other places including Tel Aviv and Ramallah. It featured two men, Rami and Bassam, from the Bereaved Family Forum sharing their struggles and realisations after their daughters had been killed. Bassam and Rami, a Palestinian and Israeli, were once dedicated fighters willing to kill and be killed by one another for the sake of their nations. Yet each one of them came face to face with the price of war when their daughters were killed in the conflict. Left with the excruciating pain of bereavement, they chose to do the unexpected. They set out on a joint journey to humanize the very enemy, which took the dearest thing from them and prevent the vicious cycle of retaliation in themselves and their societies. Along the way they reveal the friendship and humor that keeps them alive. The film follows their two parallel stories and the moments where they converge, both in their personal experiences and peace work as they face their shattered families, confused communities and opposing society. This is a critical junction in both their lives, as their life mission and personal agenda clash and they stand the biggest test to their friendship.